Click on the link above to download the Verdict 2019 Media Kit. 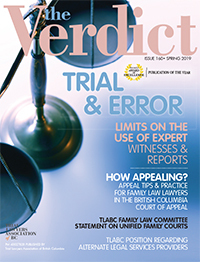 the Verdict is published quarterly (spring, summer, winter and fall). Distribution: the Verdict is distributed to TLABC members, all judges in the Supreme Court of Canada, Supreme Court of BC, Court of Appeal and the Provincial Court of BC, BC MLAs/government, Canadian Law Libraries/Universities, TLAs across Canada and the US and US attorneys/Interested Parties.